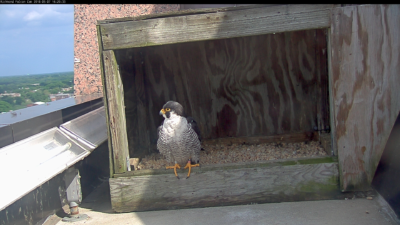 It’s been a few weeks since the male peregrine falcon has been spotted on camera, so a DGIF biologist headed downtown yesterday to investigate his whereabouts. After spending the morning checking the falcon’s various haunts around the downtown area, the biologist did not see the male falcon nor did he find any signs of nesting activity. As reported previously, the latest the Richmond pair has ever laid an egg was on May 24th in 2009. Since we are now three weeks past that date with no nesting activity observed here or elsewhere downtown, this appears to be the end of the breeding season for the Richmond male. The livestream will be shut down on Friday, June 29th. The male peregrine falcon perched in the nest box on May 7, 2018.